My 2012 goals for research and genealogical related activities are detailed in this post. I had three main goals for 2012. How am I progressing? Well, I'm doing better in some areas than others. For goal number one much, MUCH progress and success in this area! I created a research plan and spent time focusing on what I knew in order to direct my research efforts, and it worked. 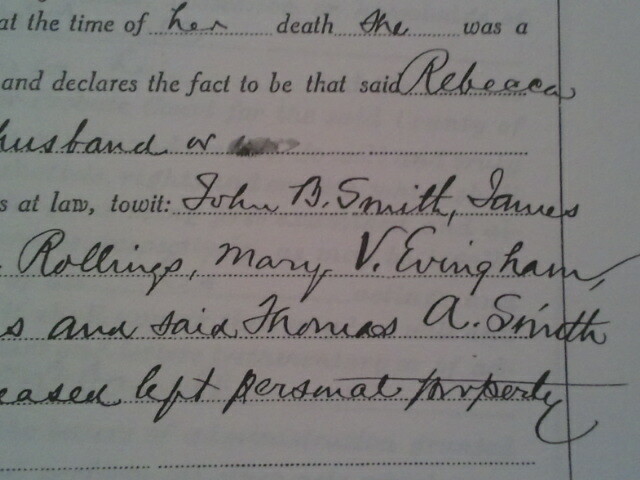 I knew these names: Mary Smith, Mary Evingham, Rebecaa Smith, Rebecca Gilpin, Thomas N. Smith and Una Evingham. I also knew they had connections to two places: Avoca Township in Livingston County Illinois and the village of Amherst in Buffalo County Nebraska. My approach was to find these people together on documents in both places showing a family connection. I've found census records, marriage records, death records, land records, probate records and county histories in both Buffalo County Nebraska and Livingston County Illinois relating to the Smith/Evingham family. I have attached a few images of those documents to this post for visual interest. 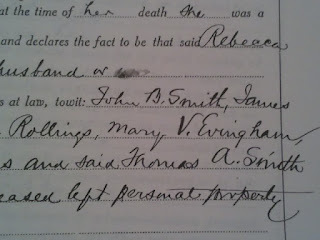 To my satisfaction, I believe that Mary Smith Robertson Evingham is the mother of my grandmother, Una Evingham. To my satisfaction, I believe that Thomas N. Smith and Rebecca Gilpin Smith of Livingston County Illinois are Mary's parents. Rebecca Gilpin Smith. This section lists the names of Rebecca's children as heirs. However, I know we are supposed to complete and utterly exhaustive search. Or is that reasonably exhaustive? :) While I feel I've been more than reasonable with this very unreasonable and uncooperative family I know I can do more. I am still searching for additional birth, death and a potential divorce record. Until I find additional documentation that causes me to question what I've found I'm ready to claim this family as mine. purchased land in Grant Township in Buffalo County NE. Una Jirene Dorothy Evingham is my grandmother, she is the daughter of Mary Smith Robertson Evingham and William Evingham (Everingham). Mary is the daughter of Thomas N. Smith and Rebecca Gilpin Smith. Next steps will be to continue to find documents to support my conclusion while I begin looking for the Evinghma/Everingham and the Gilpin families. For goal number two I've had less success. I have not attended any local society meetings. Why you ask? Well, I have some excuses but I also have some frustrations as well. If you follow me on twitter, you will have seen my battle to volunteer with a couple of different societies. I expect to turn my volunteering journey into a series of blog posts. Yes, it's been that frustrating of an ordeal and I have some ideas about how it could have gone. I have attended a Civil War presentation at the Midwest Genealogy Center this year, so I will give myself a half credit in that area. For goal number three, I'm calling "not my fault!" I read the majority of blog posts either on my phone or iPad and I continue to find blogs that are not optimized for mobile viewing. Making comments with Captcha on and the Word Press log in requirements doesn't work for me on a PC let alone a mobile device. It appears I will have to continue to make the majority of my comments on Facebook, Google+ and Twitter. Sorry, but it is what it is. I am your audience, you need to make my experience work for me and you figure out how you will deal with your potential spam issues. I see comments similar to mine everyday on Twitter (as a matter of fact I just RTed a tweet on this very issue). If you are looking for comment love, please make the comment experience as reasonably simple as possible for your blog visitors. All-in-all 2012 has been a good research year for me. I'm looking forward seeing what family members I find throughout the rest of this year. Let me know how following a research plan works for you. Our 2012 goals are quite similar. I completely agree about captchas. I am blind, and they are completely inaccessible to a person who can't see and has to use a screen reader. Inspirational, Jenna! Three good goals. I'm trying to prove a relationship too; it's frustrating. I keep re-doing old research because I can't seem to put enough minutes together to just DO IT! ugh. re blog commenting. . . thanks for making this a goal! We LOVE comments on our blogs and they are getting harder and harder to get -- and to make. I get stuck with the Blogger: Select profile thingey on my iPad... makes it take a long time. It's easier on my computer where my profile info is automatically filled in. I'd like to know your experience at my blog www.thefamilycurator.com. I know you've left notes there, was it easy? I use the Squarespace blogging platform so it's a bit different from WP and Blogger. Good luck and keep on plugging away!